To work out the area of floor required you first need to draw a rough sketch of your room then divide your room into rectangles shown by the dotted lines. 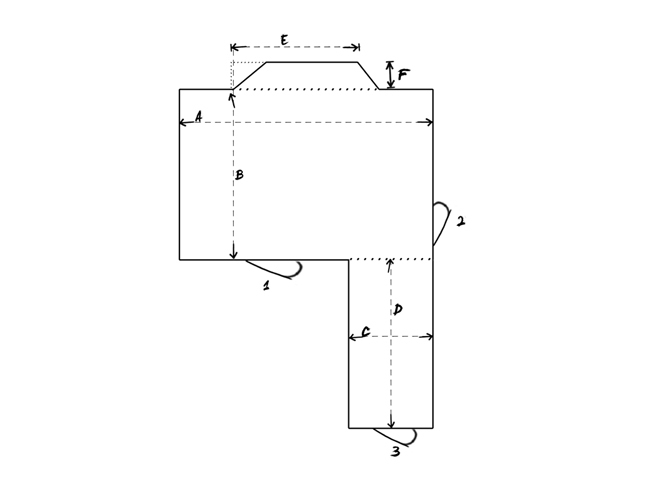 Now measure in meters the length and the width of each the rectangles shown as A,B and C and D. These figures should then be multiplied together A x B and C x D.
The bay windows area can be calculated by creating the box shown and the Subsequent lengths E and F multiplied together will give you the area of the bay window. Adding all of the multiplications up will give you the total area of the room in square meters (m²). The total area of the room should then be multiplied by 1.1 which will give you: the area of wood flooring required in m² plus 10% extra flooring to allow for cuts and the discard of defect boards.